Tetanus or lockjaw is something that we rarely hear about these days with the availability of the tetanus toxoid vaccine, which wasn’t developed until 1924. However, people living in the very dark ages of medicine who were exposed to the tetanus-causing bacteria through flesh wounds were pretty much at the mercy of the infection if the available antitoxin serums failed. 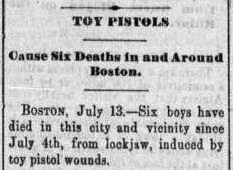 Taking into account how many people celebrated (and still celebrate) July 4 with firecrackers, reckless pistol-firing, and other potentially bloody activities, it makes sense that “Patriotic Tetanus” was a real problem back in the day. 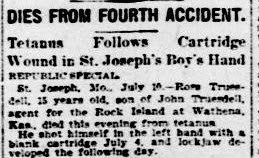 After July 4 festivities in 1903 alone 415 lives were lost to the condition. The good news in modern times is that you’re less likely to find yourself with lockjaw after Independence Day, but that doesn’t mean it’s a good idea to go out and act a fool. Safety first, people. Even if you’re not at high risk for tetanus you can still learn something from this small sampling of Independence Day death. *Originally posted in July 2014.